Features lovely violet-purple-colored, double-petalled, prolific blossoms supported by lush, dark green foliage. 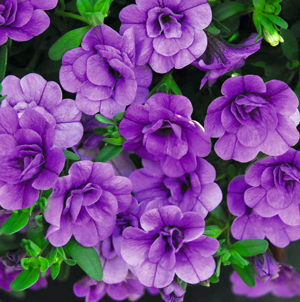 All our 'Double Amethyst' MiniFamous Calibrachoa Plants are grown and shipped in fine quality growing medium. They are guaranteed to arrive alive and ready to plant. Comment: plants arrived in good condition. They were a little slow to bloom but once they started they were beautiful. Comment: This is a nice plant, but it is a slow grower. I am anxious to see it bloom! Comment: This was my first time ordering plants online so I did not know what to expect. A few of the plants I ordered came in a separate shipment about 1 week after the bulk of my order. The company contacted me first to notify me that the plants weren't quite ready. I appreciate that they didn't send them too soon and decrease their chance of survival. So far everything is doing very well! Will definitely be a repeat customer! Comment: Plants arrived in excellent condition because they were packed correctly,thanks. Comment: I had not realized that the blooms were very small. MiniFamous Double Amethyst fits in perfectly with the Dianthus in the raised bed for wheelchairs. 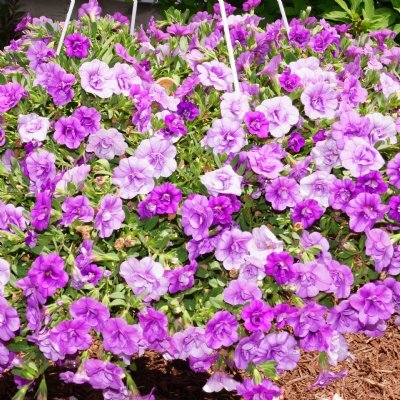 Comment: I just got these Calibrachoa plants. They were already blooming when they arrived. They are beautiful, strong, and adjusting nicely to their new potted container. Comment: My plants arrived very healthy and so well packed I was pleasantly surprised. I order a lot of plants online and they are usually half dead when they get to me. These plants were beautiful! I thought the shipping was a bit high, but after seeing how they were packed and how healthy the plants were I realized the shipping was very reasonable. I highly recommend purchasing your plants from this company...you can't go wrong! Comment: Once they took off growing they were the prettiest little purple flowers. I put them in a large hanging basket and they are beautiful. Will buy them again. Comment: I bought 4 plants each of a different color. They were properly packed and soon they began to bloom. I presently have a beautiful hanging basket with an array of beautiful colors! Comment: Love these Double Amethyst Calibrachoa plants.